The exchange of energy between the Greenland Ice Sheet and the overlying atmosphere influences regional temperatures and surface melting. 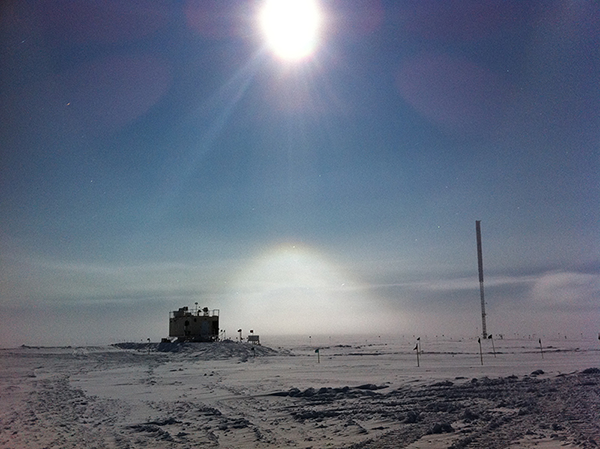 Detailed observations of this energy exchange (or surface energy budget) taken at Summit, Greenland are used to evaluate the representation of the physical processes in models. This process-based technique is useful for a variety of model types and can discriminate between the causes of surface temperature discrepancies in models. In a new study to be published in the Journal of Geophysical Research, CIRES researchers at the ESRL Physical Sciences Division and collaborators use this technique to evaluate three different models. The surface temperature response to radiative forcing at the Greenland Ice Sheet surface is underestimated in the three models studied: ERA-Interim (a reanalysis product), CFSv2 (an operational model), and CESM (a climate model). Cross-model comparisons reveal the importance of representing key processes such as those related to the radiative and thermal properties of the snowpack in models. The results of this study provide insight into the strengths and weaknesses of three different models, which provide spatial and temporal capabilities not possible with observations, including future projections of Greenland surface melt contributions to sea level rise. In addition, understanding compensating biases in a reanalysis is critical when using it to evaluate other models or satellite products. Authors of Process-based model evaluation using surface energy budget observations in central Greenland are: Nathaniel Miller, Matthew Shupe, and Gijs de Boer of the ESRL Physical Sciences Division, Jan Lenaerts of the University of Colorado, Jennifer Kay of CU-CIRES, and Ralf Bennartz of Vanderbilt University.